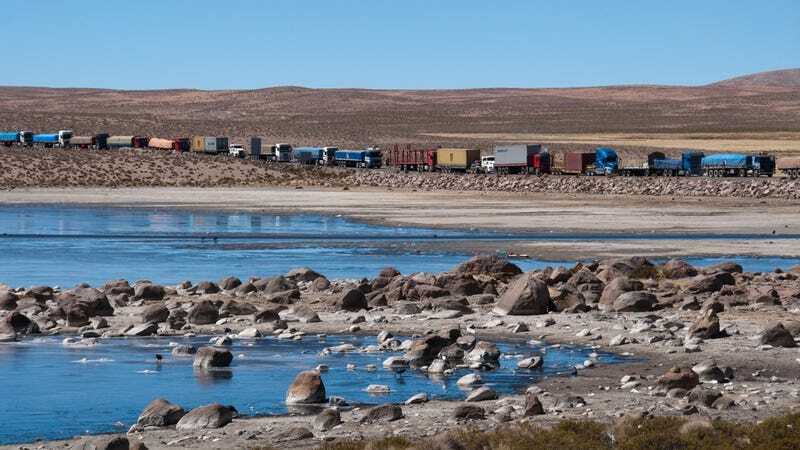 This is a queue of trucks in the Chungara–Tambo Quemado pass between Chile and Bolivia, crossing which is one of the few ways Bolivians can reach the Pacific Ocean since Bolivia became a landlocked country in 1883, after losing the War of the Pacific. The pass connects Bolivia’s Highway 4 with Chile’s Highway 11. It is probably rather unpleasant to idle up there in a truck, in the thin, cold air, under a death ray sun, but the scenery more than makes up for the triple suffering of sunburns, cold, and lack of oxygen: visible from the road are the twin peaks of Parinacota and Pomerape, perfect child’s drawings of volcanic cones which overlook Chungará Lake and the local vicuña population.